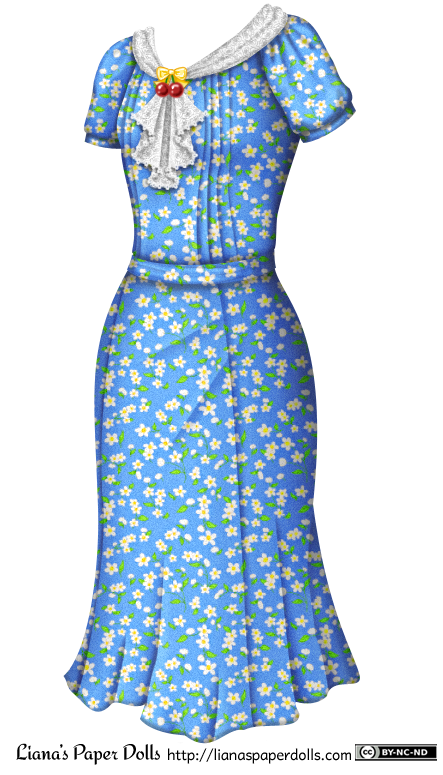 I’m breaking my paper doll slump with this 1930s-style dress! If you don’t follow me on Pinterest, you probably should, or at least you should select a couple of my boards to follow because I actually have nearly 200 boards. (I suggest Jewelry, Gorgeous Dresses and, of course, Liana’s Paper Dolls.) You may be asking, what does one person need with nearly 200 boards? The answer is, I have one board for fashion plates, illustrations and actual examples of clothes from almost every year between 1788 and 1965. Even if you aren’t foolhardy enough to hit that “Follow All” button, it’s fun to go to my profile and just scroll down, watching the fashions change. Whenever I want to draw a historical outfit, I’m always scrambling through Google Image Search, museum sites and so on for examples of outfits from that time, so having these boards is a great resource for me! I particularly like 1930s clothes, so I did a 1930s dress today. It’s mostly based on late 1930s styles (I think mostly 1937), but the pattern and decorations are my own invention. In other news, I now have PDF collections of my 2014 dolls and outfits to download! So if you want to print them out, you don’t have to fuss with each individual PDF any more. They’re pay what you want, including $0, and you don’t even have to sign up for anything or have any credit card information if you get them for free. I don’t have an elf dress ready for the next contest, but let’s get it started anyway! I will have it done by next week at the latest, and the winner can decide on the coloring then. I promise it’ll be pretty! To enter the contest, post a comment with your favorite time period for clothes. One comment per person please, and I’ll choose the winner with a random number generator. If you’ve won a contest this year, please don’t enter again. (And Mom, you’re free to enter!) The winner will get to tell me how to color an elf dress.